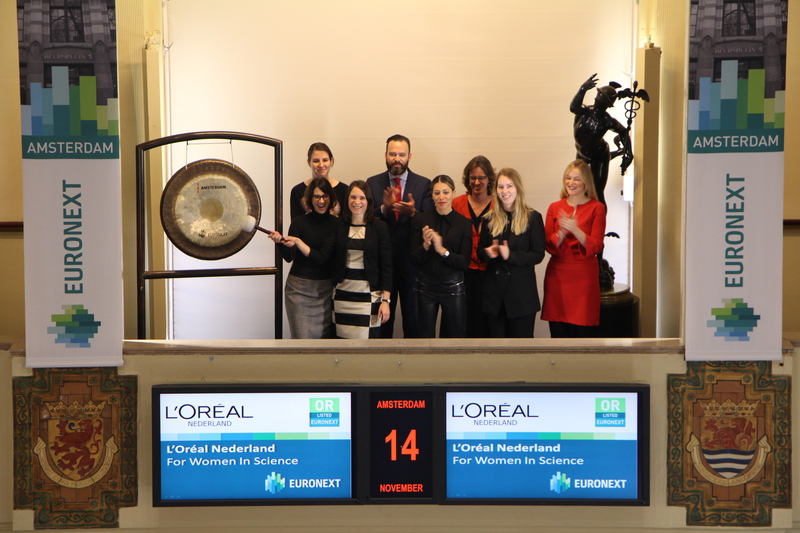 On November 30th 2018, VOGO is listed on Euronext Growth Paris. VOGO specializes in the development, marketing and distribution of a live technological solution for audiovisual content in sports venues that offers a new experience for spectators, through multi-camera on-demand live & replay content, and offers professionals video tools to help them make decisions. The VOGO SPORT solution allows spectators, within a sports venue or during an outdoor event, to access instantly and in real time, via their terminals (smartphones, tablets, etc.) to the flows of the cameras filming the event. The application offers many features such as multicam live, replay, zoom and slow motion. A version dedicated to professionals (doctors, referees, coaches or journalists) gives access to a mobile and autonomous decision-making tool, used for medical monitoring, arbitration or analysis of athletes' performance. Saturday, December 1 is World Aids Day and that day the world pays attention to the fact that HIV and AIDS are still a major health problem. Therefore in December, Dance4Life starts an campaign month with various activities. The aim of these activities is to collect as many donations as possible for the international Journey4Life curriculum. 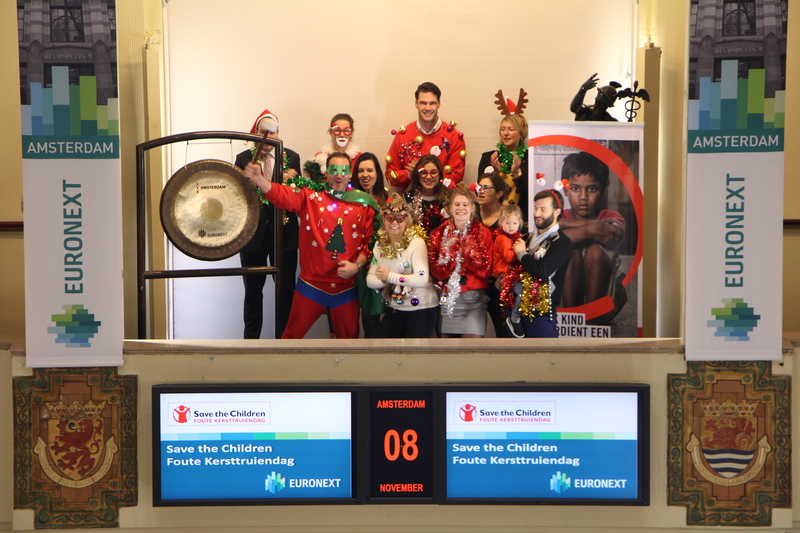 As a start of this month, the charity opens trading on the Amsterdam stock exchange. For every M.A.C. lipstick that is purchased, part of the gainings will go to Dance4Life. All donations benefit the Dance4Life teaching program. 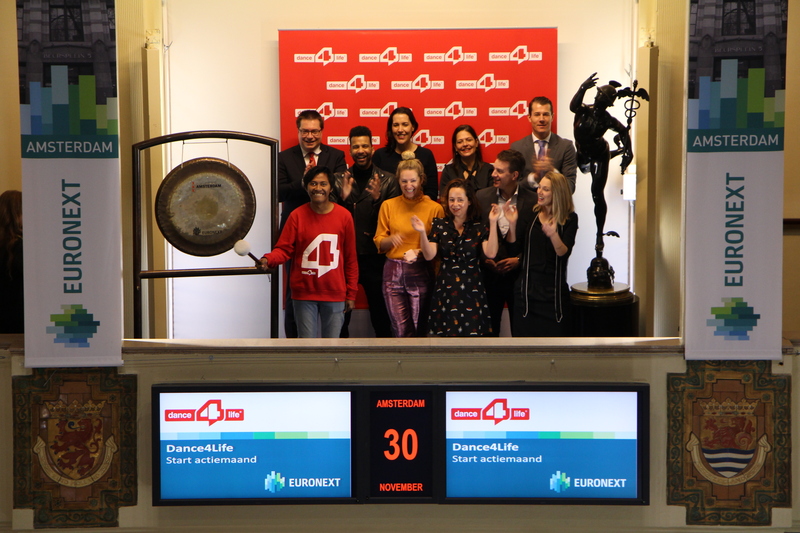 A unique concept in which influential Friends of Dance4Life approach their connections in the business world in order to donate goods that contribute to the work of Dance4Life. All ambassadors and online influencers of Dance4Life contribute to make this month a great success. 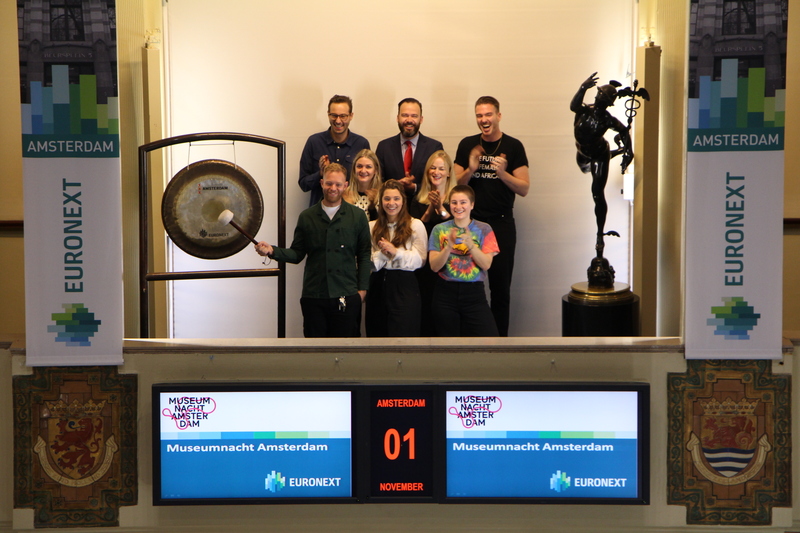 On November 23, 2018, the City of Amsterdam announced the winners of the Amsterdamse Ondernemersprijs (the prize for the best entrepreneur of Amsterdam) and the DAM Prijs 2018 (the most sustainable entrepreneur of the city). The winner of the Amsterdam Entrepreneur Award is Menno Simons from Bocca-Coffee. With Bocca Coffee he was one of the first to make good coffee accessible to a wide audience. DACSI (Dutch Advisory Committee Securities Industry) in the spotlights at tenth anniversary. Henk Brink, KAS BANK, is chairman of the DACSI association and sounds the gong. The trade association has developed into a platform where providers and users of securities infrastructure work on effective, harmonised and (hence) efficient procedures and information processing. 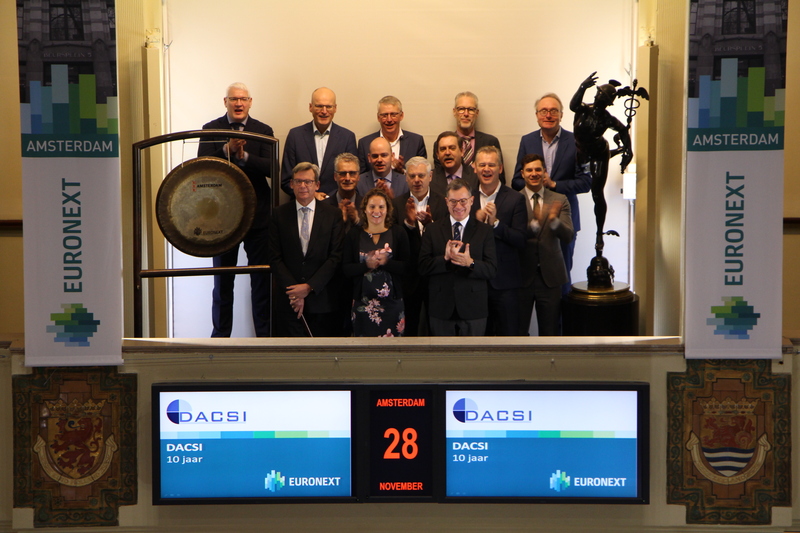 DACSI advocates the Dutch interests with European institutions, including legislators and supervisors. 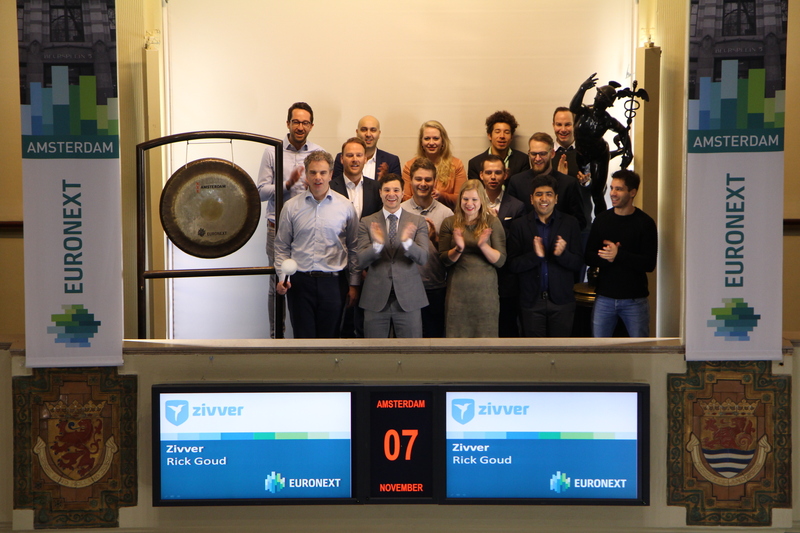 Rogier Smeets (37), winner of the Young Captain Award 2018, opens trading on the Amsterdam stock exchange by sounding the gong. The Young Captain Award is an initiative of the Young Captain Netherlands Foundation. With the awarding, the upcoming generation of decision makers will be brought under the public’s attention. 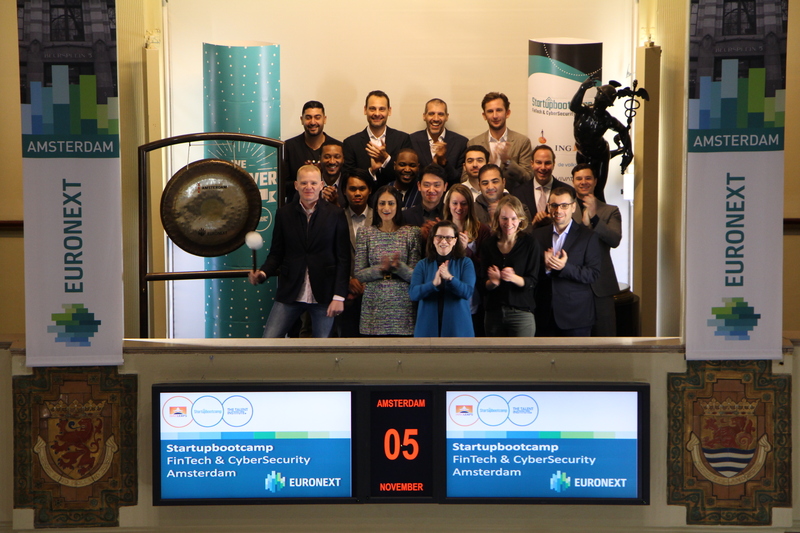 In cooperation with the Nyenrode Business University, the Young Captain Foundation organizes the Young Bilderberg Conference, a unique think tank of young business leaders. The foundation also organizes the two-day Young Captains program in collaboration with the Award partners. Candidates are prepared for the next steps in their careers. The decision was made in the presence of 120 directors and managers from the business community and the government. 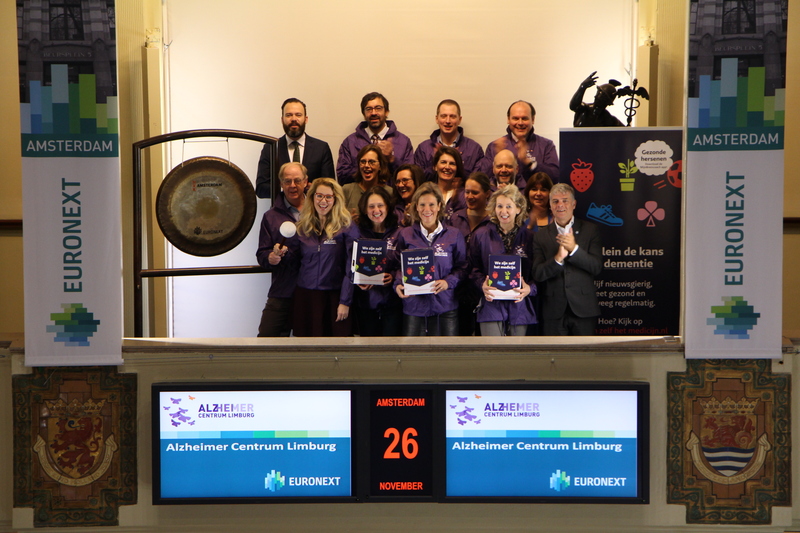 By sounding the gong, Prof. Marjolein de Vugt and Prof. Frans Verhey of the Alzheimer Centre Limburg raise attention for the prevention of dementia. They do this together with Alzheimer Nederland. The Alzheimer Centre Limburg is a cooperative venture between various healthcare institutions in Limburg Maastricht UMC+ and Maastricht University. Alzheimer Centre Limburg offers support to provide a better life for people who suffer dementia, as well as for their relatives and friends. For this purpose, it has developed a link between leading clinical research, high-quality patient care and innovative social projects. By means of the ‘We are our own medicine’ campaign, Alzheimer Centre Limburg is taking the lead in preventing dementia. There is no treatment for dementia yet. The increasing aging of the population means that Alzheimer's disease is number one. 1 out of 5 Dutch people get this disease. Refinitiv, formerly known as the Financial and Risk business of Thomson Reuters, has recently undergone a name change. 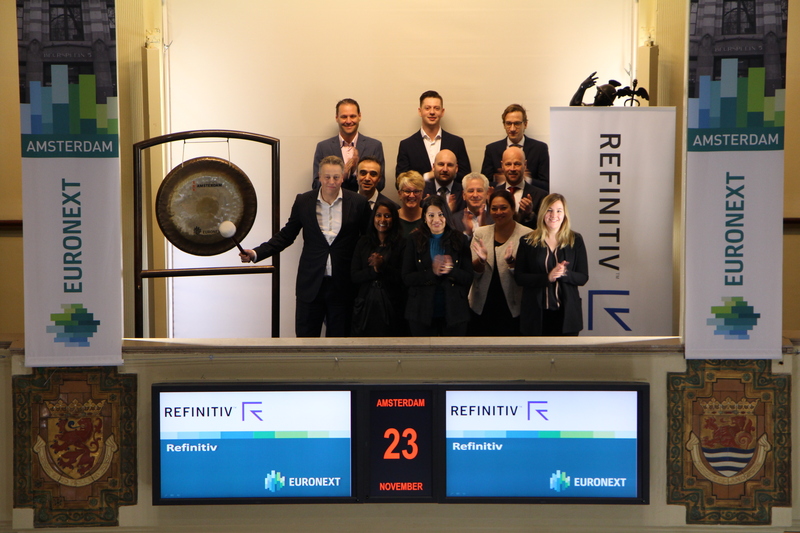 In honor of this, Hans Bloemendaal, Account Director Benelux at Refinitiv, opened trading at the Amsterdam exchange. The name Refinitiv recognizes the Reuters heritage. While the name may be new, the impact of the organization on the industry is well established – trusted by over 400,000 professionals in 40,000 firms globally. They help empower hundreds of billions of dollars in trading with up to 7 million updates per second delivered by data feeds for over 70 million instruments. Refinitiv provides the global professional FX community with access to liquidity and supports the battle against financial crimes with 32,000 risk intelligence records created every month. With over 13,000 registered developers and 2000+ active partnerships, their open platform fosters innovation and brings together expertise. 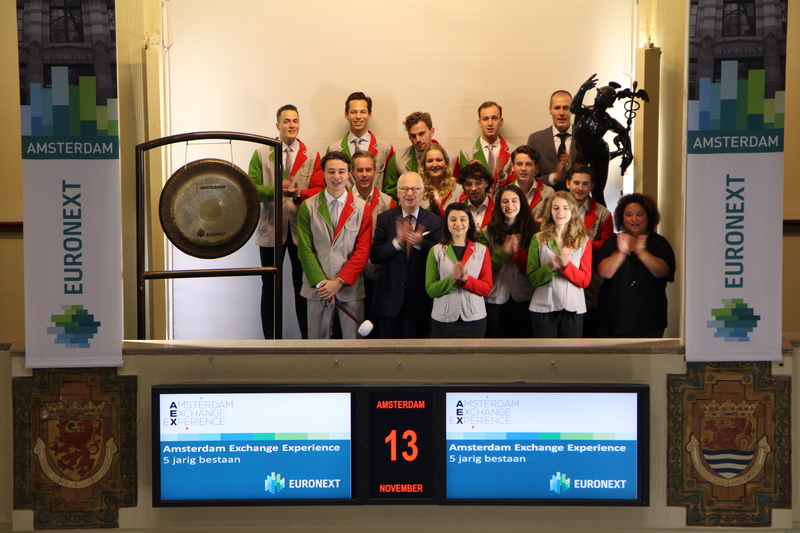 Today Bart Meussen, Executive Vice President Finance at KPN, opens trading at the Amsterdam exchange, to celebrate that KPN has won the Institute of Management Accountants’ (IMA) Corporate Recognition Award. IMA awards the prize annually to an organization that excels in finance and accountancy. In 2018 the focus was on innovation. 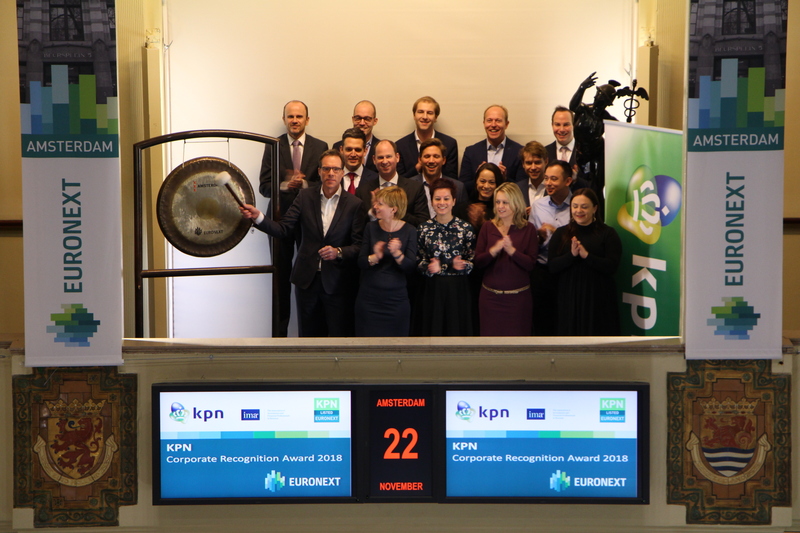 KPN has won the award for 'Besturing 2.0', a new management control system that provides access to financial and non-financial information in a 'Digital Business Cockpit', allowing for better steering of the organization and a view on not just the past, but also on the future. 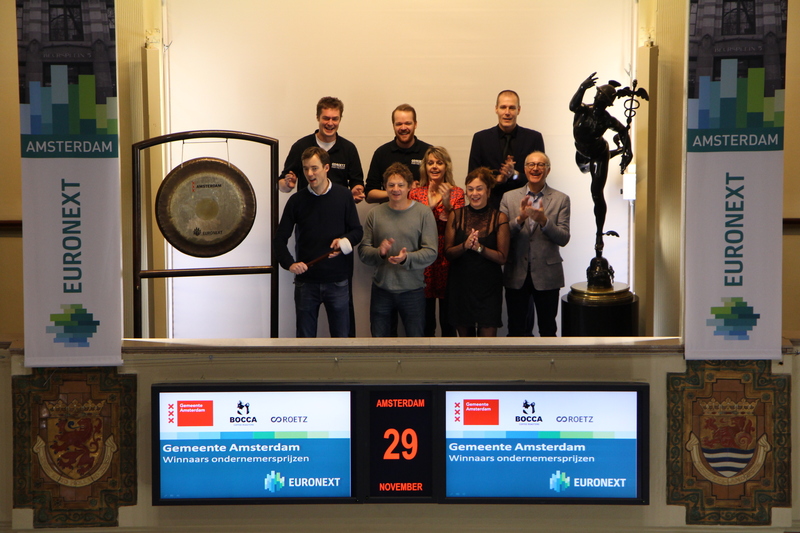 Thanks to Besturing 2.0, the Board of Directors has access to data about the outside world, the status of internal strategic projects, (financial) KPIs and company forecasts through interactive dashboards. KPN is the leading supplier of telecommunications and ICT services in the Netherlands. IMA is the worldwide association of management accountants, which celebrates its 100th anniversary this year, is active in 140 countries and has more than 100,000 members. The European headquarter is located in Amsterdam. 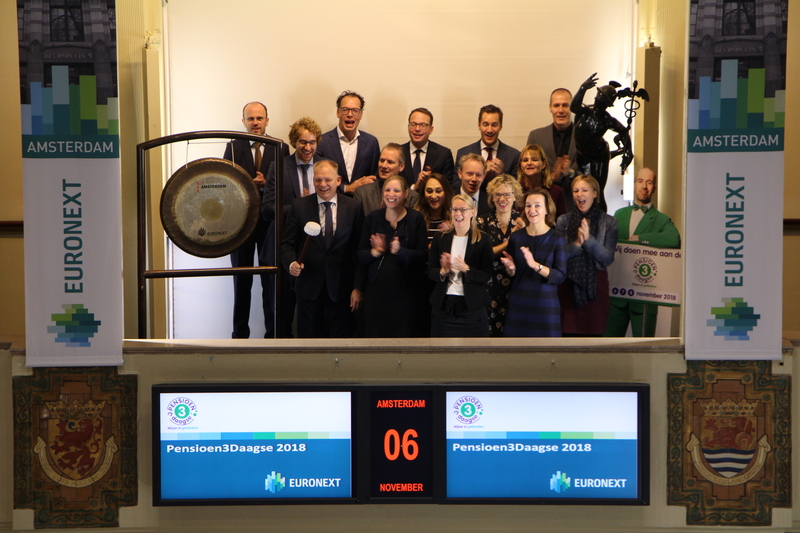 Pieter Vermeer, founder of Foundation DeBroekriem, opens the trading day at the Amsterdam exchange. DeBroekriem is a network organization especially for jobseekers. During the National Working Visit Day on the 21st of November 2018 hundreds of organizations open their doors to give curious jobseekers a ‘look behind the doors’. Organizations, employees and job-seekers are the linchpin of the activities on this day. The aim is to establish contacts and conduct network discussions within companies and public institutions. Organizations present themselves to the outside world and can enthuse interested jobseekers for their company or branch. 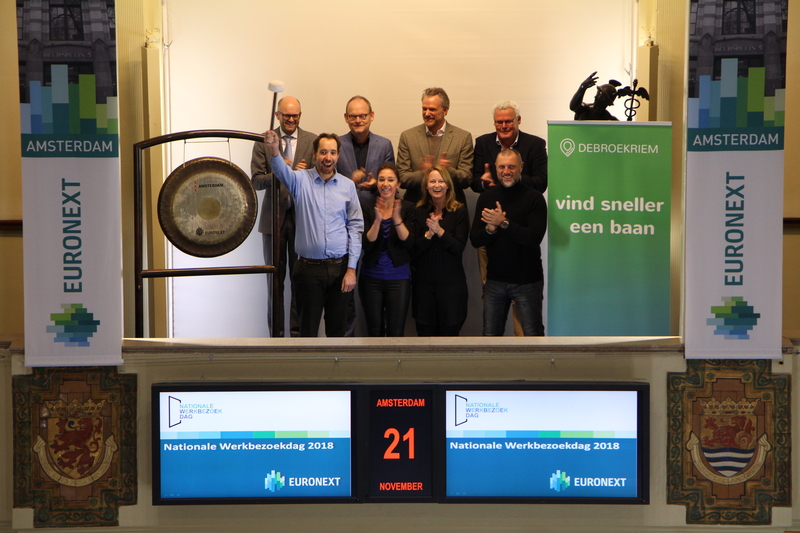 The National Working Visit Day is an initiative from Stichting DeBroekriem. DeBroekriem has the ambition to inspire job seekers and to set them in motion. We do this via an activity platform that facilitates meetings between fellow job seekers. We believe in the power of a positive mindset and the added value of active networking. With inspiring meet-ups and workshops DeBroekriem increases the network and job search skills of job-seekers throughout the Netherlands. 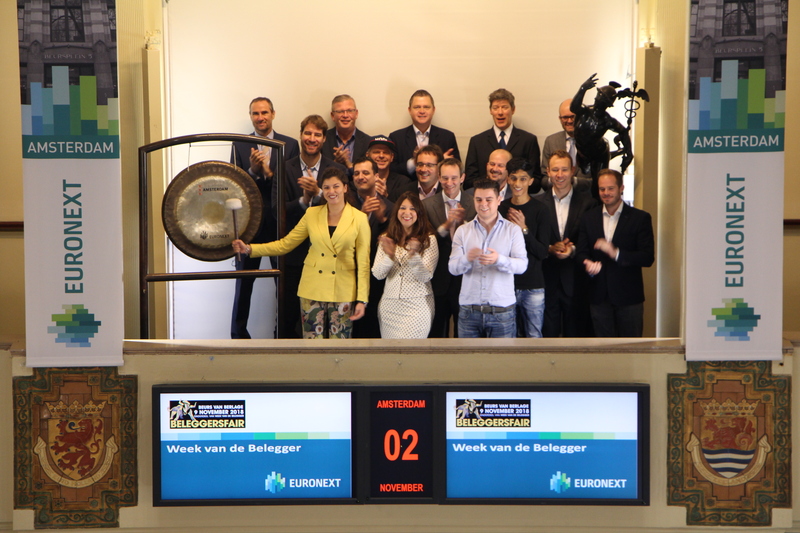 Of the 5 selected choices in the online asset management category, Doelbeleggen.nl was declared the winner, by an expert jury of IEX Gouden Stier 2018. 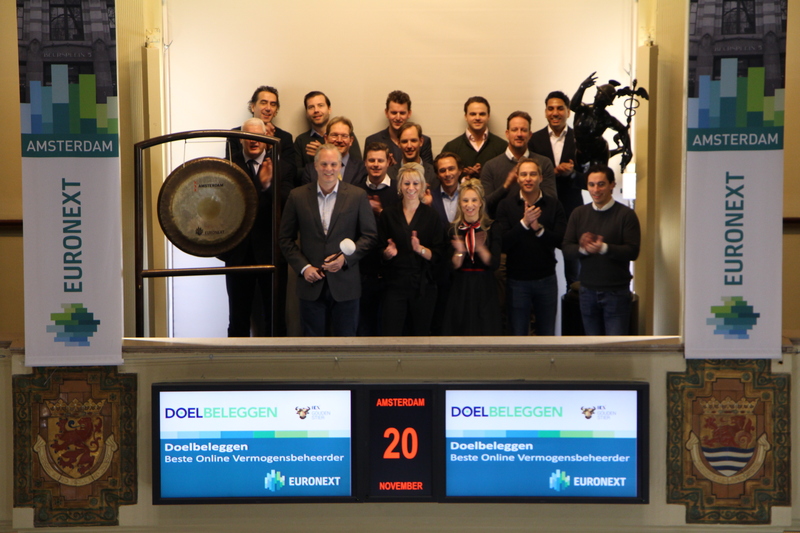 Doelbeleggen.nl was established in 2016 in response to the growing demand for online asset management, enabling controlled investing at low cost in an intuitive online environment. Doelbeleggen.nl derives its name from the unique solution for setting goals and monitoring the feasibility within the pre-set values. Euronext Corporate Services is launching a new and interactive webinar format called ‘In the Boardroom’. The format is designed to give private investors a peek behind the scenes or, in this case, In the Boardroom – a place which is normally only accessible to a company’s most senior executives. 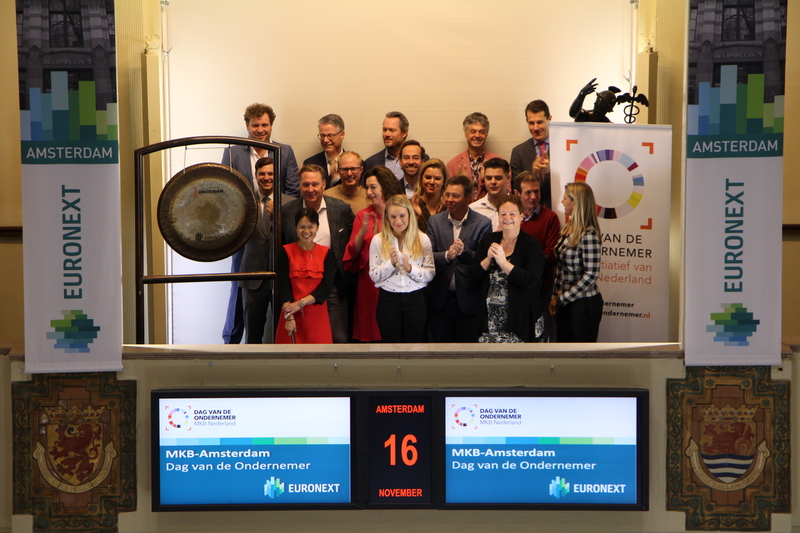 MKB Amsterdam celebrates de ‘Dag van de Ondernemer’, a day to celebrate entrepreneurship in the Nederlands. 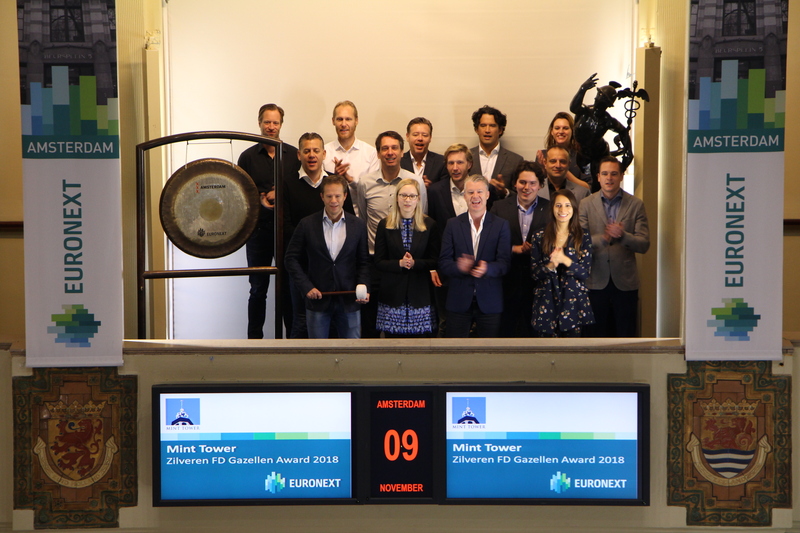 MKB Amsterdam celebrates this day by putting a number of entrepreneurs in the spotlight by opening the trading day in their honour. Andries Verder, CEO of VerderGroup and also winner of the Manufacturing Industry 100 list 2018 opens trading at the Amsterdam Stock Exchange. 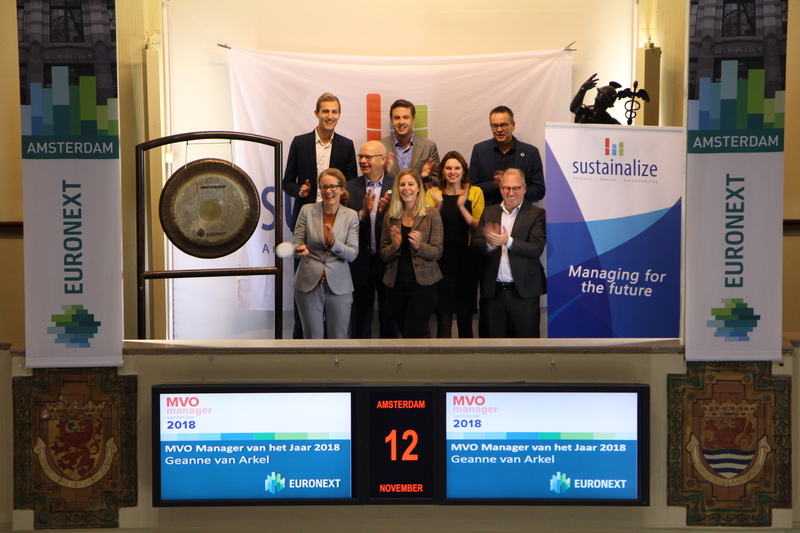 The Manufacturing Industry 100 is a list of the 100 most successful manufacturing companies in the Netherlands with a sales volume less than 500 million euros. This year’s list was compiled for sixth time by Corporate Finance International (CFI), on behalf of the Management Team. These companies are less known as Philips, AkzoNobel and ASML, butalso play a major role in our economy. The fastest growers are not found in high-tech, but in particular strong sources such as Food, Agro and metal. The number 1 orf this year is VerderGroep.